Dozens of actors and filmmakers from across the Marvel Studios have come together to celebrate 10 years of movie-making magic. It begins with Thor's Chris Hemsworth saying: "It was sort of like being at the Academy Awards or something, every person had been in one or all of my favourite films." So with that much talent knocking around let's take a closer look at the photo. The Thor star talks of "huge excitement and buzz" as he posed near Gwyneth Paltrow, who played Pepper Potts, while Iron Man Robert Downey Jr posed in front of Captain America Chris Evans. "I literally am in dead centre in the front row," said 52-year-old Downey Jr.
"And I'm looking around going, 'Any one of these people can be dead centre'." But no Marvel ensemble would be complete without Stan Lee, who co-created many of its most famous characters and makes a cameo in every film. 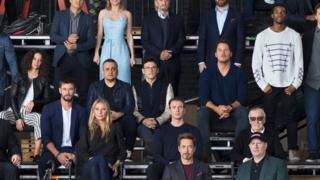 He also took a front and centre seat just behind Robert Downey Jr.
Guardians of the Galaxy director James Gunn tweeted two behind-the-scenes snaps of his own, which mostly featured his core cast with photobombs from Tom Holland and Paul Rudd. The 21-year-old Spiderman star said: "'It was like a sea of people who I've grown up watching in one place hanging out." It seems it was as much of a delight for them as it was for us. "That was crazy!" said 53-year-old War Machine Don Cheadle, who pointed out all the "fan-boying and fan-girling" that went on. Chris Pratt, who plays Star-Lord, called the get-together a "dream come true" and likened it to "being drafted to a sports team that has a legacy of championship banners." And, he may be the lead in Black Panther, but as a Marvel newcomer 41-year-old Chadwick Boseman says he was busy "looking around the room, wondering, what did I do to deserve this?" It wasn't just the superheroes that featured - Iron Man director Jon Favreau got a seat next to Chris Hemsworth. While the gathering is impressive, some big names didn't make it to the photo shoot. Natalie Portman, who played Thor's love interest Jane Foster, was notably missing, while Lupita Nyong'o, who stars as Nakia in the latest Marvel movie Black Panther also wasn't there. The Black Panther stars have recently been in London for the film's premiere ahead of its 12 February release.